Home → Vaporizers → Nautilus Review – A Compact Vape With Airflow Control At A Great Price! Nautilus Review – A Compact Vape With Airflow Control At A Great Price! When it comes to vaping, everyone has their own personal preference and opinion when it comes to the kind of vapor that’s created. Some people love big, massive clouds whereas others prefer smaller, warmer puffs. One of these isn’t necessarily better than the other, but finding a tool that allows you to truly have full control over the kind of clouds you make is often difficult to find. Or is it? We’ve seen vapes before that try to give users full control over how their clouds turn out, but these gadgets are often far too expensive for most people or too difficult to use. I did a bit of digging, and after finding the Nautilus Aspire, I just might have found the perfect vape for having complete and total control of your vaping experience. The Aspire offers tons of control and a huge tank at an affordable price, so is it worth it? We’re going to find out all that and more in my Aspire Nautilus review! Going into this review, understand that this is a vape that’s all about having complete control over your experience while using it. Not everyone will need or even want all of the features that the Nautilus has to offer, but the ease of use with adjusting the unit’s airflow really is the star of the show here. This allows you to have full reign over the type of vaping experience you want to have, and it really is the perfect tool for people wanting that control. With the Aspire, airflow control is key. 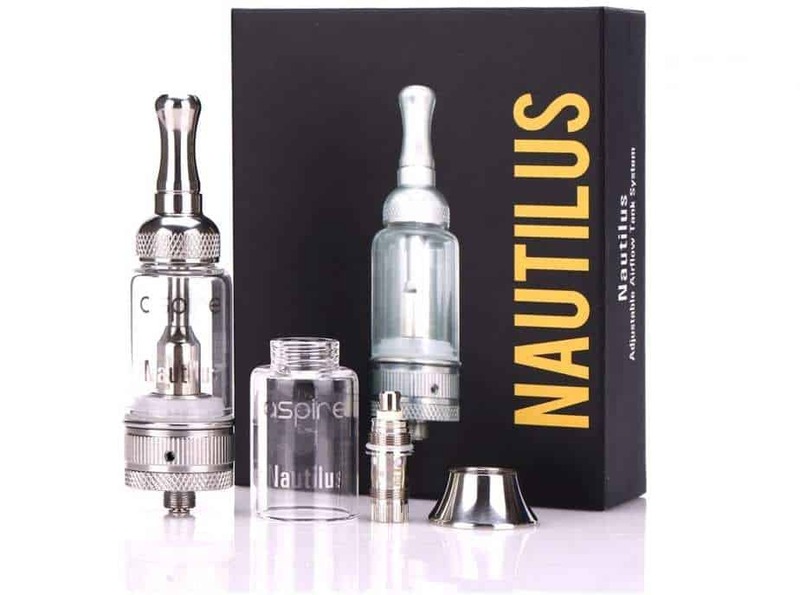 Nautilus put a lot of time and effort into making sure that the Aspire is as easy to control and use as possible, and that attention to detail really shines through with this product. A lower ring exists on the body of the Aspire, and rotating this will allow you to adjust the flow of air within the device. There are four preset options available to you, and this allows you to change the warmth of the vapor you’re producing and how much of it you actually want to create. By playing around with these settings, you can adjust the overall taste and temperature of the vape to exactly how you’d like it. Other vapes have tried to implement similar functions, but the simplicity of its implementation on the Aspire really is unlike anything else that’s currently out there. In addition to the awesome customization features that Nautilus has included, there’s also a rather massive tank here as well. Nautilus claims that its unit can hold a fluid capacity of 5-milliliters, and while that certainly would have been plenty of storage, the Aspire can easily hold 5 and 1/2-milliliters of fluid without any trouble at all. Because of the massive tank size, you’ll be able to go for rather long sessions of vaping without having to worry about refilling your unit with additional fluid. This is a godsend for many users, as smaller tanks can get quite irritating at times when you consider how much more frequently you’ll need to refill something with a 2 or 3-milliliter tank when compared to the one here on the Aspire. The Aspire certainly isn’t the most petite vape that I’ve ever seen, but what it lacks in a smaller design it certainly does make up for with a study and durable build. Although the weight of the Aspire is a bit on the heavier side, the added bulk really does make the unit feel much more durable than a lot of the competition that currently exists. Additionally, all of the extra size that’s present here feels very well used. It doesn’t feel like Nautilus made the Aspire big for the sake of being big, but rather made it larger in order to accommodate for the larger tank size and added air control features that I already talked about. You might think that the large tank size and and intuitive airflow control options would increase the price of the Aspire to a ridiculous degree, but that thankfully isn’t the case here at all. Nautilus is selling the Aspire for right around $40, and while that certainly isn’t the lowest price that I’ve ever seen, it’s more than fair for a vape such as the Aspire that’s bringing so many features to the table. $40 won’t break the bank for anyone, and when you consider the large tanks size, sturdy design, and absolutely tremendous airflow controls, you being to see that $40 is an absolute steal for something as well-made as the Aspire. For those looking for a small and compact vape, the Aspire is not for you. While the large tank size certainly is a nice addition for those who want the added space, it makes carrying the unit around a bit more cumbersome than similarly price vapes. The additional weight and size certainly is understandable when you consider everything that the Aspire has to offer, but if your’e looking for a vape that will be as compact and small as possible, this simply isn’t going to fit the bill for you. Replacing coils on vapes isn’t a particularly fun job that you look forward to, but after continuous use, it’s something that is to be expected. It certainly is possible to change out the coils with the Aspire, but doing so might prove to be a bit more difficult than other available vapes. 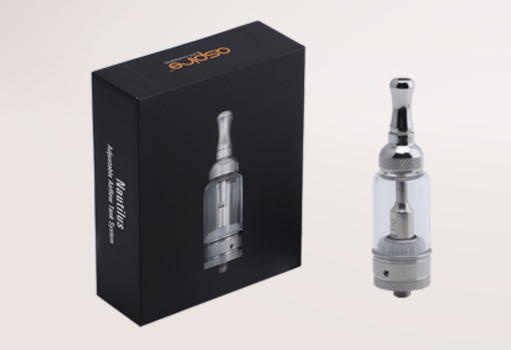 While the actual process itself is quite similar to most other units, you can only purchase coils for the Aspire through Nautilus’ website. This greatly limits the selection that’s available to you when it comes time to change your coils, and although it isn’t a deal-breaker, it could prove to be a bit of an annoyance when the time does come to finally swap out the coil that you’re using. I’ve said it before and I’ll say it again - the intuitive airflow control here on the Aspire is simply some of the best on the market. The four port sizes available for the airflow control include 0.9mm, 1.1mm, 1.4mm, and 1.8mm. These presets allow for incredible control over your vape and clouds, and the implementation of this control still remains as some of the best that I’ve ever used on a vape. It may sound like I’m overhyping the airflow control features of the Aspire, but they really are that good. Not everyone will care about having this much control over their clouds, but for someone like me who does, the airflow controls here are well worth the asking price for the Aspire on their own. Pretty much everywhere you look on the Aspire, you’re going to find stainless steel. This choice in material does contribute a bit to the increased weight of Nautilus’ unit here, but it also makes the entire package feel incredibly durable and sturdy. The attention to detail with every single aspect of the Aspire truly is something to gawk at, and the craftsmanship that went into this vape is unlike pretty much everything else in this price bracket. In addition to the Aspire’s massively large 5-milliliter tank, Nautilus has also ensured that the tank itself is spill-proof as well. I would have been perfectly happy with a tank as large as this and nothing more, but the spill-proof addition makes using the Aspire that much more enjoyable and easy to operate. And, because of the spill-proof design, you’ll be able to fill up the Aspire’s tank to the brim without having to worry about losing precious fluid and oil. This is something that’s often discouraged by other brands and vapes, but Nautilus is so confident in the spill-proof design of the Aspire that they actually encourage you to fill it up as much as possible! Speaking of the tank, I need to talk about it’s massive size once more. A 5-milliliter tank is pretty much unheard of for a vape of this price range, and you can easily spend double what Nautilus is asking for the Aspire and get something with a tank that’s half the size of what’s being offered here. I’m not sure how Nautilus was able to pull this off, and while the large tank does mean that the Aspire isn’t quite as compact as some people would like, I think it’s pretty safe to say that most users will gladly take a bit of bulk if it means being able to get a huge 5-milliliter tank. As you can probably see from my Nautilus review, I’m a huge fan of the Aspire. Nautilus truly went above and beyond with this vape, as it’s honestly one of my favorite finds. Between the airflow control, large tank with its spill-proof nature, incredibly sturdy design, and affordable price tag, it’s really hard to not love what Nautilus has created here. If you’re in the market for something with excellent airflow control and a large tank, this is the vape for you.